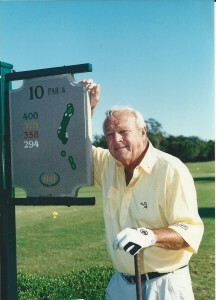 In his column posted yesterday on GolfChannel.com (which of course he helped start) Arnold Palmer touched on a two important topics. On the eve of his tournament, the Arnold Palmer Invitational, at his course, Bay Hill Club & Lodge, he pointed out how golf, not just the PGA Tour but all of golf is a fantastic engine for generating charitable contributions. Everyone knows that’s true but the second point is more important and concerned his concern unless we keep everyone playing the same Rules of Golf, our game could be headed for real trouble. It’s not the debate over so-called bifurcation that’s important but how it emphasizes how the USGA has lost touch with the game it is supposed to govern and that the organization seems to be stumbling towards being irrelevant to the millions ordinary golfers. As has been written in this column numerous times golf’s governing body is run by well meaning but out of touch people with a consistent record of being behind technical advances in equipment and changes to the nature of the game. So it’s nice when The King agrees. With the USGA’s and R&A’s decision to recommend a ban on anchored putting and the consequent opposition from the PGA Tour, the PGA of America, golf equipment manufacturers and some rank-and-file amateurs, the stage has been set for something more ominous. I think we’re facing a serious challenge to the rules that govern the global game. My concern is that the fabric that unites us, the tie that binds you to me and me to Tiger and Tiger to you – one set of rules – will be irreparably torn. If both these ruling bodies proceed with the proposed ban and if the Tour, the PGA of America and eventually the average player in effect ignore it, where does that leave us? Where does that leave a guy like Tim Clark, who has for years legally and successfully anchored his putter? Where does it leave the guy at your club or local muni who’s grown comfortable with what has always been a legally anchored stroke? If they decide to ignore the Rules of Golf, how will the USGA maintain a relevant voice in the United States on other vital issues such as growing the game, slow play, golf course maintenance and their charitable work? Does it leave the U.S. Open and the Open Championship adrift from the other majors? Could the USGA’s other great championships or the Tour’s own events be diminished? I have enormous respect for the USGA and the R&A. Both have been an important part of my life as both a competitor and a man for well over half a century. Many of the friendships I formed when I was playing in U.S. Amateurs, U.S. Opens and Open Championships in the early part of my career thrive to this day. I’ve worked closely with the USGA on a volunteer basis for the better part of my life. Regardless of how you or I or the Tour feels about it, the USGA is charged (along with the R&A) with the responsibility of writing the rules by which we play. They are the final judges. I think – I know – that they take that responsibility seriously. I hope that behind the scenes the USGA, the R&A, the PGA Tour and the PGA of America – four of the central golf organizations of my life, all of which do remarkable work growing and promoting the game – can come to some understanding and we continue to have one set of rules for everyone. Like most older players, I want to pass along to my grandkids a game that’s stronger and healthier than the one I inherited. That means a game with the interwoven threads of philanthropy and integrity intact.